The first and second rounds will be spread across CBS, TBS, TNT, and TruTV. The Sweet 16 and Elite 8 will be split between CBS and TBS. The Final Four and Championship will air on CBS. 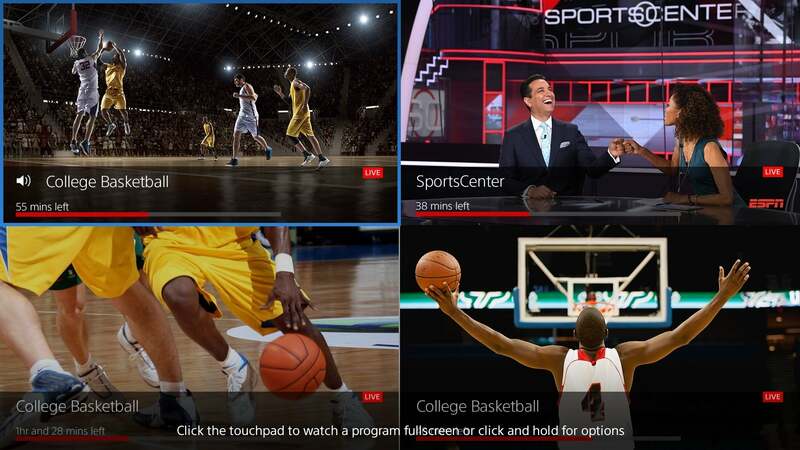 Complete March Madness coverage is available through PlayStation Vue ($45 per month), DirecTV Now ($50 per month), Hulu with Live TV ($45 per month), YouTube TV ($40 per month), and FuboTV ($45 per month), assuming they carry your local CBS affiliate. Use the links for each site above to check local coverage in your area. CBS is available for free with an antenna, or for $6 per month with CBS All AccessRemove non-product link. TNT, TBS, and TruTV are available without CBS as part of AT&T WatchTVRemove non-product link ($15 per month, or free with certain AT&T unlimited wireless plans) or Sling TV ($25 per month with Sling Blue, $30 per month with Sling Orange and Comedy Extra). 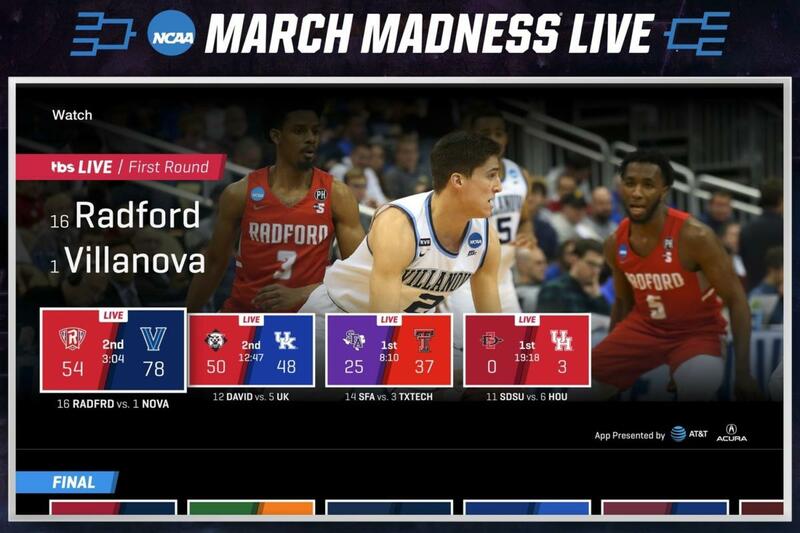 The free NCAA March Madness Live app will let you watch up to three hours of live coverage on TNT, TBS, and TruTV at no charge, even on TV devices such as Roku, Fire TV, and Apple TV. (CBS games are also available for free, but only on mobile devices and laptops.) The three-hour limit applies to each device you have, so you could switch between multiple devices to maximize your free viewing time. PlayStation Vue now allows you to watch up to four live channels at a time on Apple TV, or up to three channels at a time on PlayStation 4. To enable this, just press-and-hold the select button on any channel, choose “Watch in Multi-View,” then select your channels. You can then long-press any channel to reposition it on the screen. PlayStation Vue can show four games at a time on Apple TV, or three at a time on PlayStation 4. Even if your device doesn’t support split-screen, you may want to give the March Madness app a try, as it lets you quickly open a sidebar to switch between games. That can be faster than thumbing through the channel guide of whatever live TV service you’re using. Alternatively, you can switch between recent channels on YouTube TV by scrolling down from any live channel, while Hulu with Live TV provides quick access to recent channels in its grid guide. One more disclaimer: If you have an older Roku, Fire TV, or Chromecast, you may not be able to watch in 60 frames per second due to the limitations of the hardware. Of course, if you have an antenna connected directly to your television, you’ll always get 60 frames per second with live sports (or, if you want to get technical, 60 fields per second for 1080i broadcast channels like CBS). Some networked TV tuners such as HDHomeRun and Amazon Fire TV Recast will support 60fps as well, but others, such as Tablo and AirTV, will not. So what’s the best way to watch the NCAA Tournament overall? My vote would be on PlayStation Vue through an Apple TV, as it supports fast frame rates and multi-channel viewing, any service that provides 60fps video, and a quick way to switch between live channels should do the trick when you’re trying to monitor your brackets.